I have always wanted to build such unique and legendary aircraft as the F-117 Nighthawk. 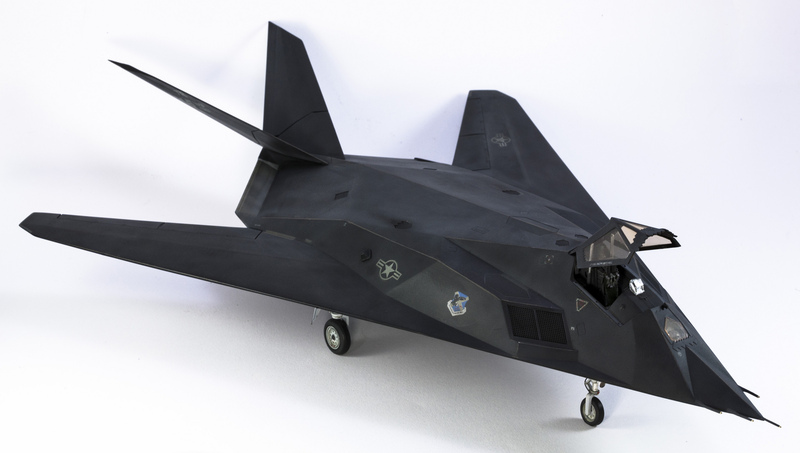 The stealthy F-117, along with other specially-designed aircraft like the P-61 Black Widow, U-2 Dragon Lady, and SR-71 Blackbird have one thing in common: they are all painted black. As I happen to have the 1:48 scale Academy F-117A Nighthawk in my stash, the next obvious question is how you paint an aircraft black? As many reference photos show, black painted aircraft are really not that black. Instead, to the naked eye, their paint looks more like it was made up of a combination of different tones and shades of dark grey to extremely dark grey to almost black. Academy’s original F-117A (kit no. 2118) is far from decent. There is very little detail, hardly any options, and the decals are much to be desired for. In essence, the kit has little to offer except for the price tag. With that said, I decided to put more weight on the aircraft’s weathered appearance by building various but subtle tonalities of dark greys and blacks. My first order of business is to work on the ‘office’. I always like to show my models with the canopy opened. But to do that, I need to add some details to the rather bare cockpit. On the ejection seat, I added texture to the cushion, and made the harness out of masking tape and copper wire. The tub, especially behind the cockpit got much needed attention. To make it more “busy”, I added 0.2mm sheet styrene, bits of copper wires, aluminum tubing, and plastic rod. After quick priming, I painted the interior XF-53 Neutral Grey and dashboard panel’s flat black, and followed by dry brushing XF-19 Sky Grey.Once the cockpit is complete, it was a matter of putting the diamond-shaped fuselage halves together, along with the wings, and V-tail section. And as of that, I was done with the main construction! The next phase was to prepare the smaller bits. That means getting the job done on the bombs, weapons bay and cradles, wheel wells, and landing gear doors. For the landing gear struts, I added stretched sprue for the wiring and used aluminum foil for the oleos. The original tires were too large so I replace them with a pair from an F-15C that I found in my spare box. I primed all the pieces and painted flat white. I gave the tires a quick mask and painted them XF-85 Rubber Black. Finally, I gave all the pieces a wash with Mig Interior Wash A.Mig.1003. To save valuable time, I also worked in parallel on the weapons bay and cradles, wheel wells, and landing gear doors. Switching gear, it’s time to focus on painting the laser guided bombs. You will need some patience when painting these GBU-27s because it involves quite a lot of masking. After a black primer, I masked and painted the fins XF-58 Olive Green, and bomb and tail unit XF-62 Olive Drab. To make it more interesting, I built them as inert bombs. To do that, I masked part of the bomb and guidance unit and gave it a mix of XF-18 Medium Blue and XF-4 Flat Blue, with a ratio of 4:1. I then gave it a wash using Mig US Modern Vehicle Wash A.Mig.1007 and filter them with thinned XF-49 Khaki and XF-57 Buff. Now I am ready to tackle the aircraft. After I masked and placed the canopy onto the cockpit, I quickly gave the whole airframe a shot of Mr. Surfacer 1500 Black. Once dried, I started marbling XF-69 Nato Black; spraying in controlled small circles but keeping everything irregular in nature. This was then followed by spots of diluted XF-63 German Grey. The key world is self-control and subtlety. This ritual was done over and over again at least three times until I was satisfied with the look. All of the panels on the F-117 were taped to reduce radar signature. And these tapes leave unique marks on the surface of the aircraft. To imitate those marks, I used Tamiya masking tape that was cut in 2mm strips. With the help of a drawing compass, I measure the lengths and locations for the strips. I then tightly sprayed a much diluted mix of XF-63 German Grey and XF-52 Flat Earth over the strips. It was quite laborious working on both the upper and lower section of the F-117. To mimic the exhaust stains, I masked the area off before spraying XF-52 Flat Earth and lightening it with layers of XF-57 Buff. By glossing up the model, it’s time for some the decals. I decided to choose an airframe from the 415th TFS training unit during the F-117 early days in Tonopah. I think this would fit perfectly with the inert bombs and high-visual markings of the day. I had a hard time working with the decals that came with the box. They wouldn’t settle properly and there were significant silvering on all of them, even with the help of Mr. Mark Setter on Softer. As a last resort – though I do not endorsed this – I brushed Tamiya Airbrush Cleaner onto the decals to permanently “melt” them down. After gluing all of the smaller pieces, I gave the aircraft a decent dose of flat clear, and took off the masking tape from the canopy. You must know how it feels to have those masks finally off!! One last weathering involves replicating streaks across the lower underbelly of the Nighthawk. Some images show the F-117’s underbelly is covered with leaked fluids. To create that effect, I brushed a diluted X-19 Smoke in the direction of the airflow. Once dried, I mopped the same area with a cotton swab moistened with X-20 in the reverse direction (contra-airflow). How hard does it take to paint an aircraft black? It’s not as hard as you think. Like any color, black has different ranges and tonal values. With a little effort, you can build this type of model a notch higher by understanding color and putting some weathering techniques on to the bird. And through self-control and subtlety, you can make a plain black finish aircraft come to life.